What is MLM Gateway a network that works or? For once I am not in my spam folder or the chat box. No, it landed in my inbox. 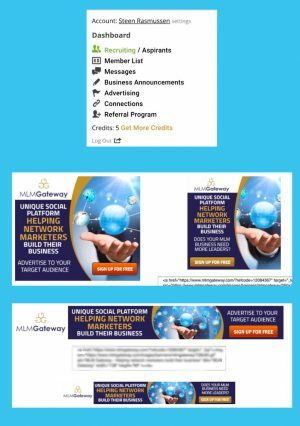 So what is MLM Gateway? 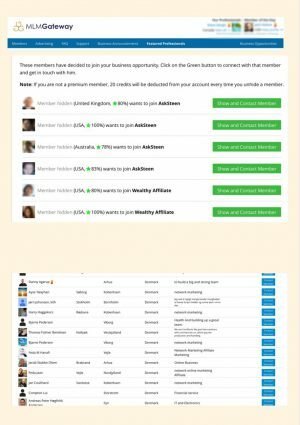 I am a free member and have spent some time to test whether this is a good opportunity to network. Yes, what is it we’re doing? I see a social network for people who like me are making money niche. Here are some MLM people but to my great surprise here also people dealing with anything other than direct marketing agreements. Do you have a deal you are working with, so you also have a network here? The first I met after I wrote me up via Facebook were all the other members here from Denmark. I got a brief tour and had made my profile right now. They use either your Facebook. Or G + profile as a base for your profile on the network. So it’s quite easy not. After the guided tour will I presented to our all of the Danish members of the page. You have 5 points to start with, and it allows you to write five different suits as you work. It is quite a way to contact others who have the same interest as you. Now you can do two things to get more credit. First of all, there is the freeway, which just goes out that you get people to use the network. You could, for example, make by posting your affiliate link in the social media along with a small text about why you think it’s a good idea with this network. The person who sent me the email gets 5 points for that I have created a profile. Your affiliate link you can not avoid seeing it is almost on all sides as you click around. You can also buy credits by paying money for it here pay you from getting points to advertise your suggestions or contact other users. It requires a minimum of 10 points to create an advertisement. Means that you either need to buy you more or recruit you more points. It takes 20 points to show your business page for one of the other members, and it is self-interested. Not all members who work in network marketing. You can ask to be exempted from the people turn to you with all sorts of deals that you are not interested. There are many active members, and the media have been online for some years now. It can quickly become expensive to turn to the other members here. As a member who has not paid, I would say that there are very limited opportunities to start the dialogue with other members. Either you pay, or you recruit you if you want to use the platform. Who is MLM Gateway For? MLM people here, but I have encountered, and other industries, for example, individuals who like me has spread me out to work with affiliate marketing that has nothing with MLM or direct marketing as it. I’m a little puzzled by the wide range that is indeed among just the Danish members as I can see. Some of them I know from other media, so here it will be a little silly to use my points to contact them. But within this rating is helpful should I have burned them so I can pass a bit more about how end systems were going on. is not any training about the platform itself, but it is not necessary to sign up or create a profile. Everything you’ve already done in social media. For the rest are not intended as training education or build the business around the platform. These are networks usually to your MLM deal or network you to be part of another deal. You can write to the side do not feel that you have got the point that you either have recruited you. Can not log in since then shenanigans come from your Facebook or youtube account. I have found a few Facebook groups, but this is unfortunately not very many members, and not anyone act together. Not that the items their link there but they communicate a way, not with each other there. I can not say that it is expensive to join because it is free. If you want to display your business, or people to sign up to your list, so it’s going to cost you the amount. You can go the way of buying more points. The cheapest option is to spend $ 60 and get 50 points a month for three months. But you can download your affiliate link free and earn up to 50% of a sale is not entirely wrong. Ok, a social network to network marketing people. I do not know quite what I find here. But let’s try to compare it a bit with a media that we are all aware. Here you can create fan pages and groups where you can communicate directly with each other. If you do it right and are very tight in your rules, you can create a group chat where members can be that of regular communications. I’ve even made it around some live stream which I have done. But it’s a different story. So we have reached the fan page where you can promote your personal website or your MLM business. The last I’ll probably still do with a personal website who promote your MLM product. Here you can buy traffic, but you can target the much more accurate than you can with this network. Yes, you can choose the price and audience. Yes to split tests but do well with everything paid traffic. Want to connect with other members it will cost points. So money or the points as you can scrape together by recruiting others to the network. Something I do not quite understand is that there is no news blog. Maintained you can put an advertisement on the side and target it to the target group who have the same interests as you. Especially when we’re talking, about a place where you can network. Here is also no chat and it makes it a little lively page. Select when we talk about connecting networkers who want to network on their online business side. We each have our idea of what we want to work with also online. Is it an MLM business then we are most likely to try to recruit our fellow human beings. But whatever you want to work with so you must have a base. A place where you are the character who gets others to follow you. It need not be difficult, some are using social media and are very active there. Others create their unique house in the countryside. I refer to the Internet. Do you have a large room which can receive many visitors as you also have a lot of traffic to your business? But requires work to maintain, and build it bigger. Yes, you need an education just like with everything else in life. But here is where I have spent the last three years developing myself and my pages. Let us become freely meet on the other side. Then you get my help and the rest of society there. Test it, and it’s not for you then you have a web site that you always can build on. Although the network seems a little dead on me, so I will not say that it is decidedly spam. You may, after all, be a free member. But they do not have PayPal and deals with bitcoin gives me a little extra to think. Not that I see payza and visas as quite secure money transfers. But they are not having had the network for so long also connected to PayPal gives me thought that here are not updated as much as you as a member could wish. Ok, it’s easy to make connections and people write to you and ask about what you are dealing. So in that way, I can easily recognize that it is a network of individuals who want to connect with others who work online. The point where I have to say that something is missing significant is education. I refer specifically to a network as MosaicHUB where members can ask and be guided in almost any direction if they want to learn how to develop their business idea. 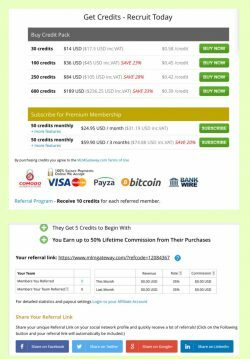 Here is good enough not advertise but there is daily created a lot of value for you to continue your online business. There is also a very specific plan you can follow and take action on at your pace. Something you might also consider is to start creating your online platform. Yes, start working seriously with your objective. 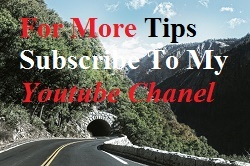 See here how to get started. Are you a member of this platform and you have something to add then give your opinion below in the comment box. You may also like to Share and Like on your social networks. MLM is another internet opportunity but to me i seen it as too promising. I did not know you have to pay before getting points to contact other members. Please if I met know, how can you get your money back as a profit? Thanks for this deep thought and been very helpful. Hello Collins! Thanks for the comment. The only way you can earn money here is by recruiting others into the network. But it is a network where you have the opportunity to discuss and promote your business to other members. But you get as I said some commissions fee from the members you recruit and buy anything through the network.